Joseph graduated valedictorian from Ashland University in 2014. 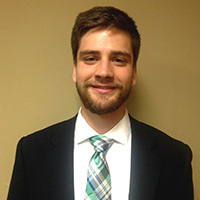 His senior thesis on Lincoln’s Biblical allusions in the Gettysburg Address won the Charles Parton Award for most outstanding thesis. While an undergraduate, Joseph interned at the Heritage Foundation’s Center for Principles and Politics and the Claremont Review of Books. Joseph’s primary interests are American Political Thought, constitutional law, and political philosophy. He is currently writing his dissertation on the American common-law understanding of the right of parents to direct the education of their children. When he is not reading, Joseph watches witty TV shows and the Cleveland Cavaliers with his wife and their baby boy. “The Voice of Nature and the Parent-Child Relationship: An American, Common-Law Understanding of the Right of Parents to Direct Their Children’s Education,” paper presented at the meeting of the American Political Science Association, Boston, Massachusetts (September 2018, forthcoming). Panelist, Colloquium on "Defending the Constitution: The Federalist," Alexander Hamilton Institute, Clinton, New York (June 2017). “Masters and Friends – Friendship’s Moderation of Liberalism in ‘Benito Cereno,’ Go Down, Moses, and Huckleberry Finn,” paper presented at the meeting of the Southern Political Science Association, New Orleans, Louisiana (January 2017). Panelist, Colloquium on "The Cold War and American Statesmanship: Thoughts, Words, and Deeds," Alexander Hamilton Institute, Clinton, New York (June 2016). “Constitutional Statesmanship: The Rhetoric of Jackson and Lincoln in Preserving the Union,” paper presented at the meeting of the Southern Political Science Association, San Juan, Puerto Rico (January 2016). Panelist, Colloquium on "Churchill and de Gaulle: Statesmanship in a Democratic Age," Alexander Hamilton Institute, Clinton, New York (June 2015).